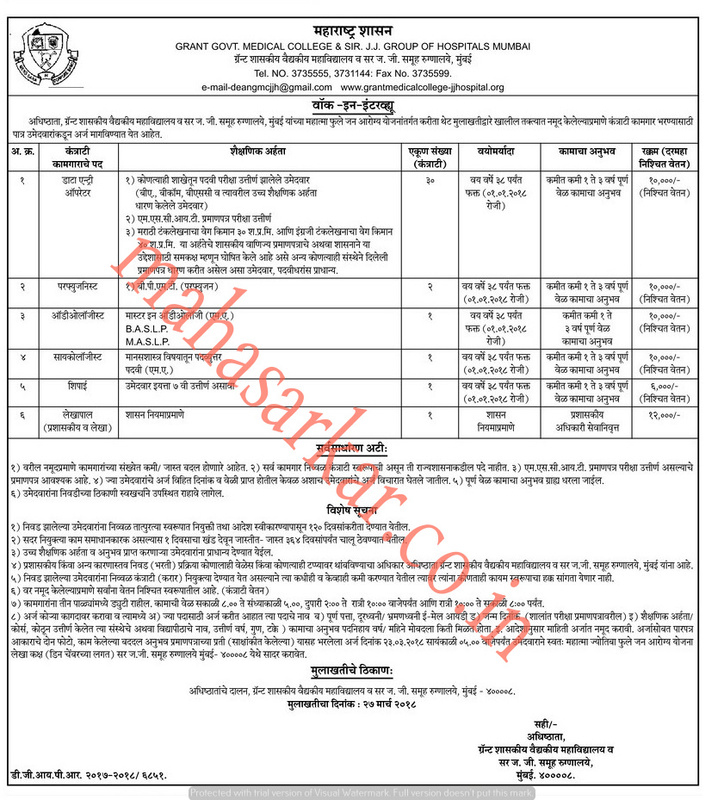 Grant Govt Medical College (Grant Govt Medical College & Sir JJ Group of Hospitals),Mumbai Published Job Notification for 36 Data Entry Operator – Audiologist & More Posts. Candidates who wish to apply must look at Grant Govt Medical College Data Entry Operator – Audiologist & More Recruitment 2018. Eligible candidates can join Walk-in Interview on 27-03-202018. Education Qualification: BA/B.Com/B.Sc/MS-CIT/BPMT/ B.A.S.L.P/ M.A.S.L.P./ MA in Psychology /7th Pass and More. For Post wise Education Details follow the detailed advertisement. Age Limit: 38 Years as on 01.01.2018. Interested & Eligible candidates may attend for walk in interview along with all the documents addressed at Grant Govt Medical College and Sir Jamshedjee Jeejeebhoy Group of Hospitals, J J Marg, Nagpada-Mumbai Central, Off Jijabhoy Road, Mumbai, Maharashtra 400008. Starting Date, Last Date to Apply Offline at Grant Govt Medical College & Sir JJ Group of Hospitals which candidates should be remembers as follows.